Trade show and event budgets are always tight. Concerns about overspending require keeping all costs under control and eliminating those considered unnecessary. Experienced exhibitors know event carpet installation should never be considered unnecessary. Renting event carpet is costly, but event carpet installation is as important as having a booth display. 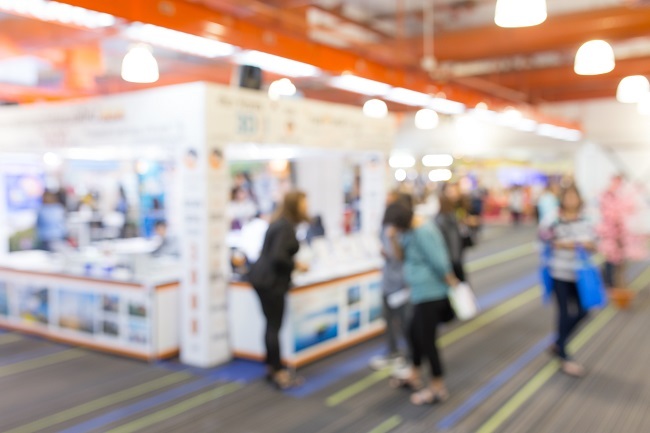 If the event organizer does not require exhibitors to carpet their space, consider this: If you have more than a draped 4 foot table for your display, you need carpet and padding. Your carpet installation defines your booth space, separating it from both adjoining booths and the aisles. For maximum effectiveness, if your booth carpet color is the same as the event color choice for aisle carpeting, consider using a contrasting color border. Carpet color, when carefully chosen, showcases and complements your product and your booth display. Using a different color carpet to accentuate a specific product or space draws visitors directly to those areas. Always have padding placed under a booth carpet. Two important reasons: visitors and booth personnel. Standing and walking on carpet with padding minimizes tired feet and legs. Visitors may be inclined to talk longer about your products. Booth personnel will be less tired. Professional carpet installation ensures there are no rug hazards from seams, edges, or bulges from plumbing and electrical lines that need to be placed under the carpet. The benefits of renting event carpeting include having a professional installation of an unused, clean carpet. Using an exhibitor owned carpet may sound like a good cost cutting measure, but the cost of shipping, cleaning and storing such a carpet is prohibitive. Last, but not least, the installation of event carpet is best thought of as an integral part of your booth display. One requires the other to be effective. To discuss your specific event carpet requirements contact SES today.